Here’s a popular game for all platforms, it’s Air Hockey. One such version of this game is by Hyperkani (a Symbian/Nokia developer on Nokia store. Very pleased to see them making apps for our Lumia). Anyway, this is actually a different developer, though you might be familiar with their games already as we have featured their work in #93 and #96. On to the game itself, it’s a great implementation of the game. You have both 2 player options (which not all have) in addition to playing against the computer/phone. In one player you have four difficulty modes – when on expert you can see it’s really challenging with the CPU really on edge and very aggressive in the way they slam the puck at you. 2 player is fun also playing against someone else (had a funny moment playing a different Air Hockey with a friend and it turned out the app we had only had 1 player and they weren’t actually doing anything). Most importantly it is very fluid and responsive. There is no drifting away of the mallet and it goes where your finger is (can’t be taken for granted). The sides light up when hit (and you can see a burst of particles as it does so), as does the mallet. The phone will also vibrate when coming into contact with the puck. I really like that you can flick the mallet towards the puck (not really a standard move I guess, but something my friends and I do when playing real Air Hockey) – only suggestion is to perhaps add some physics to it so it slows down rather than abruptly stopping – but that kind of move is suited really to tablet so I guess it’s fine for this smaller screen. Very excellent game, whilst free the ads are also not intrusive to the game play. 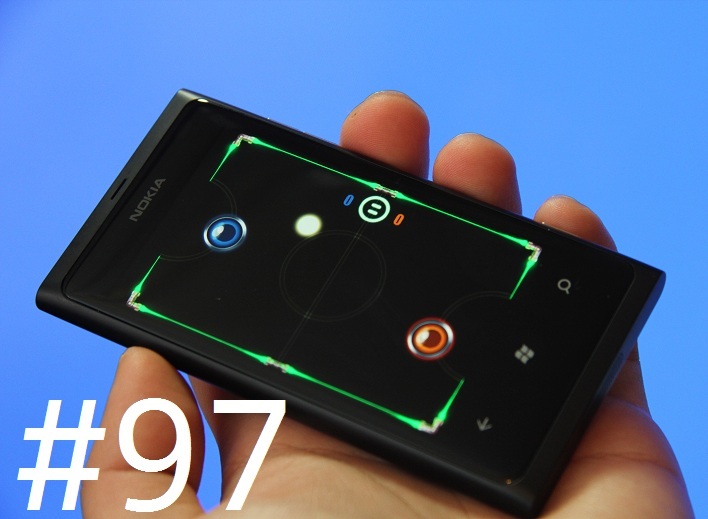 The coolest air hockey game comes to your phone! If you like Basketball, Glow Hockey or other sports games, you shouldn’t miss this game. Extremely cool designed graphics, colorful particle effects, realistic physics, super-smooth gameplay and vivid soundtrack! Both 1 player mode and 2 players mode are provided, addictive and thrilling! Challenge yourself with the computer opponent in the 1 player mode. There are 4 difficulty levels to choose. The Insane level is fabulously crazy to play! Coordinating your hands and eyes, challenge with your friend in the 2 players mode on just one device. You can experience real game feeling just like in game room. Keep your nerve and control your paddle, keep the goal then make a good shoot. Let’s begin the fantastic journey! – Don’t worry about the ad, the bottom ad on the game page has been deleted. – Adjust the goal a little bigger to make the game more exciting and challenging.